Around a year ago, after SpaceX Falcon Heavy first test flight, I found this amazing 3d model for Falcon 9 and Falcon Heavy on Thingiverse from the user chemteacher628. I’ve decided to print it myself, so I downloaded the parts, uploaded them to Tinkercad to assemble the model virtually before printing it, to check if everything was ok. While I was checking it, I’ve decided to make a few changes. Now that Falcon Heavy has taken off again last week, I thought it was a good time to share the modifications I’ve done. First of all I uploaded all parts to Tinkercad. Then I noticed the connections between parts was kind of fragile, so I added a single cylinder in the center to make the model a bit sturdier. I also extruded the SpaceX and Falcon logos on the rocket booster and fairing, making it noticeable on the print, which also makes it easier to paint later. Regarding the strongback, I separated each of the base parts in half, which were too big for one print, to reduce risks of it failing. I didn’t have much success with the legs of the boosters, I’ve tried printing them but didn’t work so well with the opening mechanism. I tried to change the design a little but it also didn’t work, so I recommend printing the original ones. Since I didn’t need to open and close the model’s legs, I just moved on and didn’t care much about it. These are the main changes but there are other minor edits as well, like the addition of support in the fairing connectors for example. Keep in mind this takes a lot of time to print, some parts can take up to 3 hours. Also, some parts might not be in the best position for printing, so you should check that before printing. I’ve had these files on my computer for a while, so I thought I’d share it in case someone else might find them useful. After printing everything, I put it all together using superglue to assure things would stay in there places. Then I painted the logos in their respective colors using nail varnish, which works surprisingly well on PLA. Now it stands nicely on top of a bookcase, I’ve added a strip of white LEDs on the bottom to illuminate it upwards. On its side is the Soyuz rocket, which I’ll also upload to thingiverse soon. And that’s it. 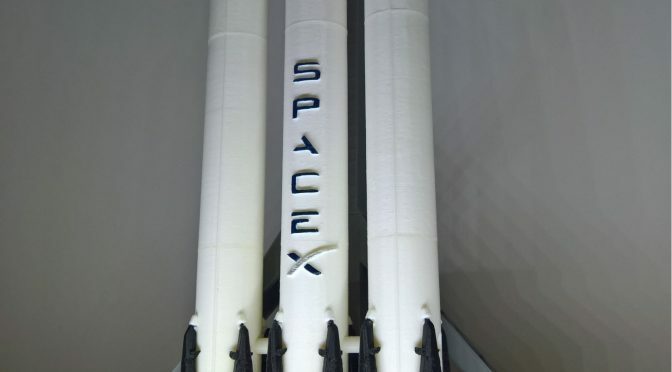 The rocket model is about 82 cm high, plus 2 cm from the Strongback base, which gives it a scale of about 1:86.